Congratulations to Ingrid K, Achatblois and manthapowers. If your name wasn't drawn this time, take heart... another Diana Ferguson Jewelry giveaway is coming up very soon! 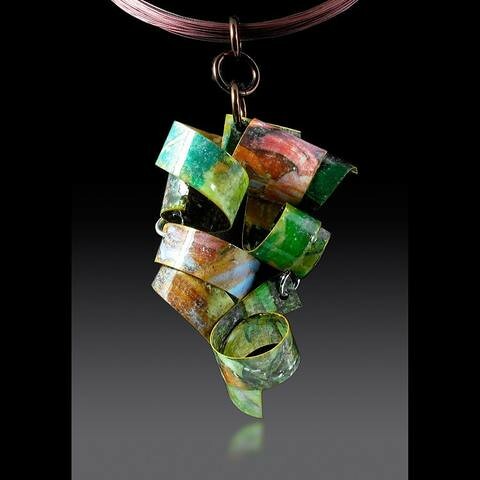 Longtime readers will remember that paper jewelry always gets my attention... I've admired Diana Ferguson's beautiful work for quite a few years. 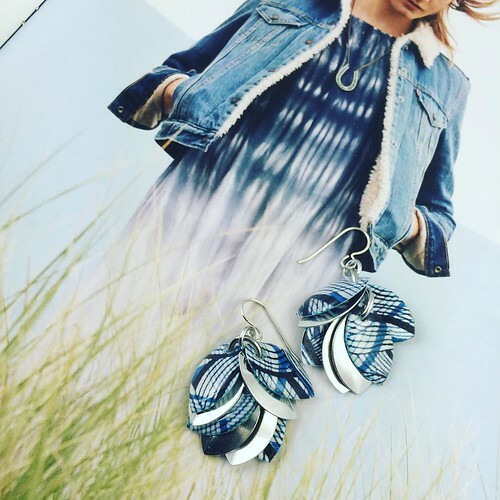 Diana Ferguson Jewelry is not only unusual in the way the designs range from fun to elegant, but the handcrafted Petals to the Metal collection of drop earrings has a definite paper aspect. First, Diana creates digital patterns and collage on watercolor paper that are combined with anodized aluminum and jewelry grade resin. 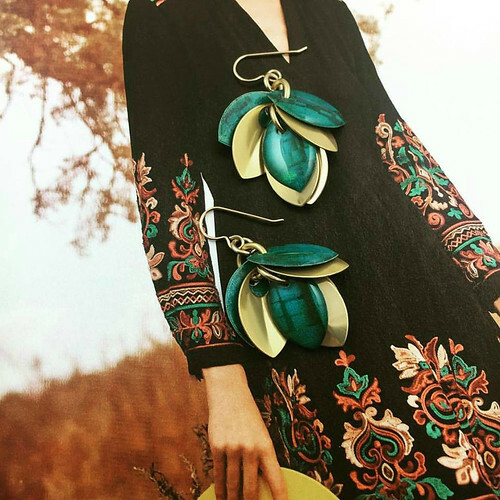 The result is sturdy, yet truly lightweight statement jewelry to add style and flair to your wardrobe. 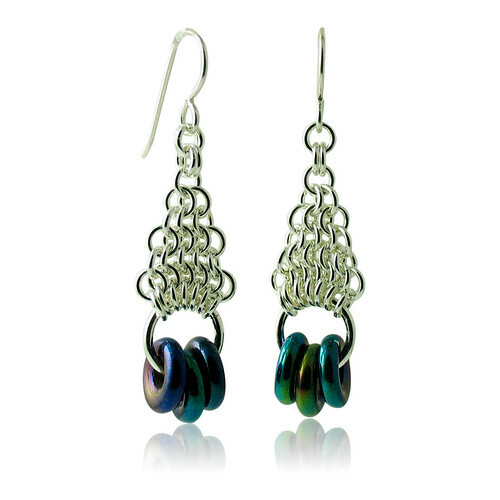 Each pair of artistic earrings is available in three lengths: 2", 2.25" and 2.75". 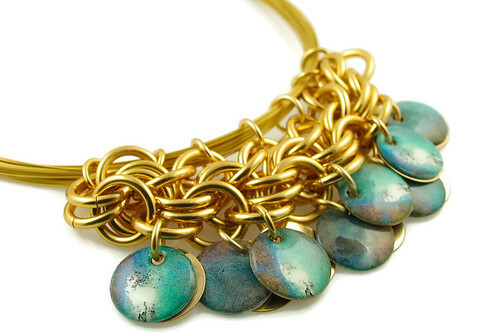 In addition, Diana designs and weaves chainmaille Patina jewelry in precious and alternative metals, sometimes combining it with paper/resin elements. She makes hand-beaded earrings as well, a couture collection called Adorn. Diana's Fall - Winter 2016/2017 collection of Petals to the Metal Earrings is inspired by favorite fall and winter hues from denim blues to exotic yellows and vibrant purples. 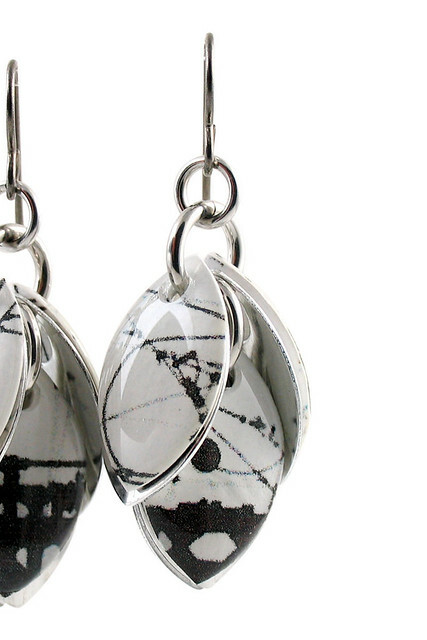 Of course, graphic black and white are always popular too, and look great all year round. ...as is the lightly sculpted paper and chainmaille necklace below. A polymer protects the layers from moisture and fading. Now about the giveaway! Diana will be sending three lucky winners a coupon code to use for or toward a purchase from her website. One of the codes will be for $30, another for $40, and one for $50. For low priced options, have a look at Diana's On Trend collection. Earrings start at $24. I will do three drawings using a random number generator. The coupons will be valid for use by the winners through December 31, 2016. This is an international giveaway. Please note that the winners will be responsible for paying the difference if the total of the chosen item and shipping fee exceeds the coupon value. 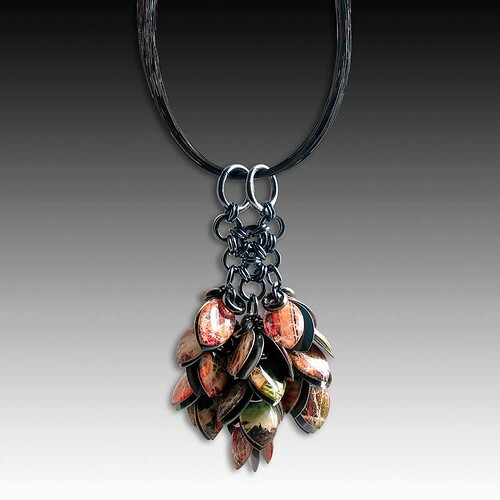 To enter the giveaway, visit Diana Ferguson Jewelry, choose your favorite piece and name it in a comment below. Note that Blogger does not allow me to see the email address you type into the form with your name, so you will need to include an email address within your comment. If you are concerned about spam, type it this way: janedoe at gmail dot com. This giveaway is also underway on Instagram. Enter at one or both places by the end of Saturday, November 19, 2016. Winners will be announced at the top of this post and on the Instagram giveaway photo as soon as they have been notified. Good luck! 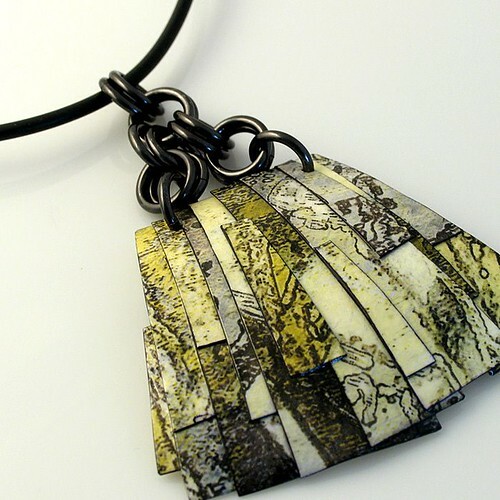 Love the paper/chain maille necklace. Oh my - hands down best piece is the "Team Spirit" Gator earrings!!! I need these in my life! Beautiful jewellry. Love the infinity heart earrings. They're all so pretty! I would be delighted to have any one of them! I love the Time Warp mystery of the Northern Lights earrings. Simply stunning. I love her custom Signature Cuff!!! Amazing stuff! The Im-Press Red Dangle Earrings do just that - impress.